Couple of months ago I did a post about healthcare costs in retirement and mentioned that they been increasing at 6.5% a year. I this post I want to provide some details on where this number comes from and compare it to other inflation metrics. 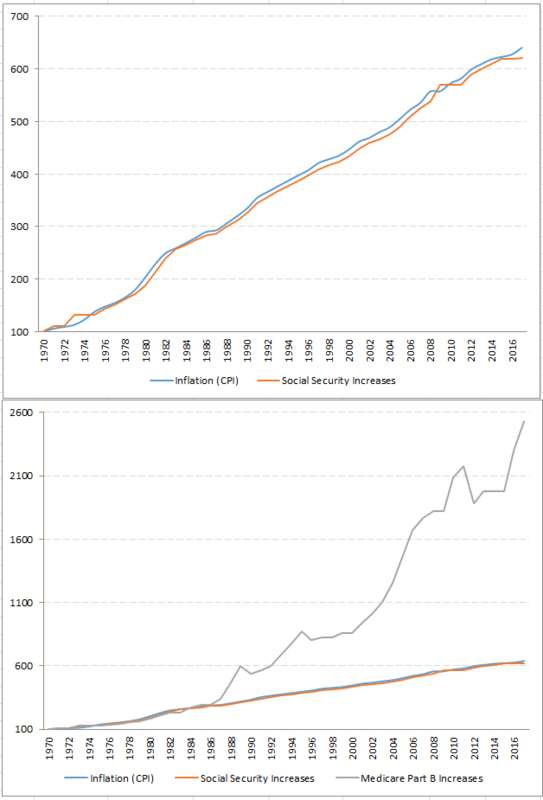 Exhibit 1 shows how standard Medicare Part B premiums have increased over the past several decades compared to Social Security retirement benefits and more general inflation as measured by Consumer Price Index (CPI). Those are annualized growth rates (see notes at the end of the post about how these numbers are determined each year). In the 1970’s all three tracked in line, then in 80’s Medicare increased almost twice as fast. Since 2000 they have risen over 3 times faster. Overall Medicare premiums have increase at 7.1% per year (faster than 6.5% reference above) while top line inflation was “only” 4%. Exhibit 2 shows the same information as cumulative indices in a chart form. The first panel compares CPI to SS COLA. Despite different calculation methods, they track each other quite well so we can make a case that Social Security benefits are keeping up with the inflation. Second panel adds the Medicare Premium line and wow what a difference. The scale changes dramatically and the divergence from mid-80’s just keeps getting bigger! As an aside: Some people insist that the official government definition/calculation of inflation is not to be trusted, personally I don’t believe in those conspiracy theories and think that CPI is close enough for government work. Driven by big increases, Medicare premiums are becoming larger and larger burden on retirees. 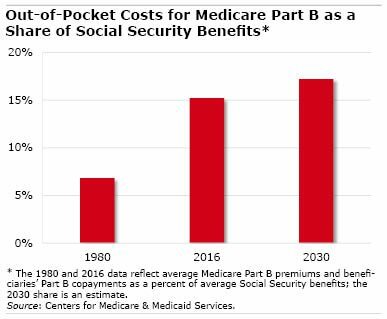 Exhibit 3 shows Medicare Part B costs as a % of average Social Security benefit. It almost tripled since 1980 to 15% and is projected to continue increasing. Well now you know where some of the big increases in healthcare costs come from. One day I might take a more detailed look at various components of healthcare costs and their inflation. “The standard Medicare Part B premium is determined by a formula contained in the 1997 Balanced Budget Act, which set the premium at 25 percent of total program costs. The remaining 75 percent of program costs are financed through general revenues. The Medicare Modernization Act of 2003 (MMA) required higher-income beneficiaries to pay a higher percentage of program costs, resulting in multiple tiers of premiums based on income.